The Miami Dolphins and Cleveland Browns have completed their Week 3 contest in Miami’s Hard Rock Stadium. The game featured two 0-2 teams coming into the week, with both trying to right the ship. In a game no one seemed to want to win, the came away with the overtime win. Every week, we keep a running tally of what happens in the game, giving quick thoughts and immediate reactions to what happened in the game. You can follow along below, and you will see my immediate reactions at the end of the article. Dolphins getting the ball first. Well that did not take long. First play of the game, Kenyan Drake, who started at running back, for no yards. Second play, Ryan Tannehill interception. Of course it is Jamar Taylor who gets the pick. Why wouldn’t it be? FUMBLE! Browns quarterback Cody Kessler fumbles the snap, but gets right back on it. Brings up 3rd down. SACK! FUMBLE! CAMERON WAKE! Dolphins recover! Jason Jones with the ball. Dolphins giving the ball to Drake a lot to star this game. 3-yards, 8-yards, 11-yards on first three plays after fumble recovery. 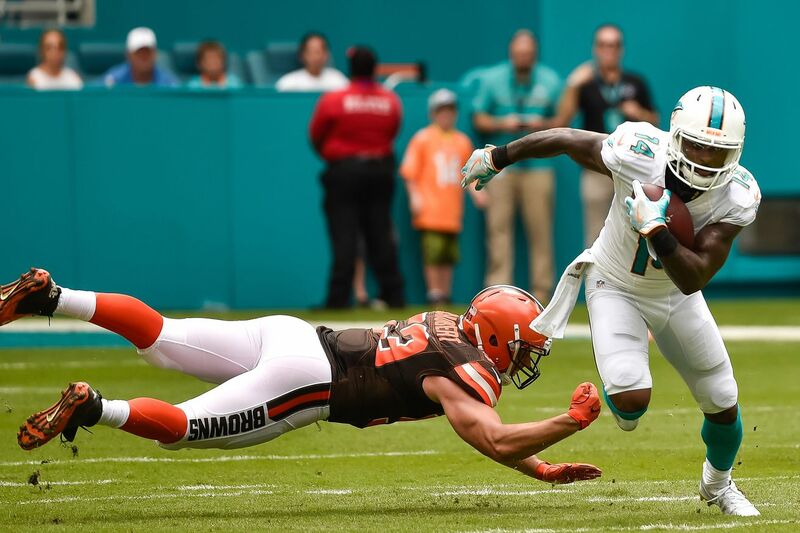 Jarvis Landry with the catch for 13-yards. Ties up the league lead again. He had it coming into the week, with Julian Edelman passing him by one with the Patriots’ Week 3 game on Thursday. TOUCHDOWN! Tannehill to DeVante Pakrer for the 26-yard touchdown! Miami 7-0. It’s the Terrelle Pryor show on this Cleveland drive. Pass to him for 9-yards, run from him as the QB for 15-yards, pass from him for 26-yards. Xavien Howard nearly has the pick-six on the Pryor pass. Dropped the ball. Missed 41-yard field goal! Miami gets the ball back. Jay Ajayi getting his rotation in the offense now. Jarvis Landry with the reverse. Landry misses the 3rd-and-7 reception. Was a little in front of him, but he did not seem to fully go after it either, with footsteps coming. Either way you look at it, on Tannehill or on Landry, the Dolphins are punting. The Browns may not call it a “Wildcat” with Pryor at quarterback, but it sure looks like a Wildcat offense, and you don’t Wildcat the Dolphins. Terrelle Pyror is the Browns offense today. They aren’t moving the ball unless he is touching it. Field Goal. Browns. 46-yards. Miami 7-3. Dolphins get killed by a Branden Albert false start on 3rd-and-2, fail to convert on 3rd-and-7. Punt time. Jordan Cameron is being evaluated for a concussion. Pick six. Tannehill with the bad throw straight to the linebacker. Browns 10-7. Dolphins moving the ball now. Tannehill finds Stills and Drake. Damien Williams with the 15-yard run. Just under two minutes remaining. Dolphins need to keep the Browns from driving. Or not. Pryor back to beating up the Dolphins defense. Browns get ball to start second half. Fumble! Xavien Howard forces the fumble, but Cleveland recovers. Missed field goal. 11 plays for 7:33 to go 46 yards and miss a 42-yard field goal. Miami gets lucky with second missed field goal of the game. Tannehill to Landry for 16 yards. Touchdown! Tannehill to Landry for 42-yards. Dolphins 17-13. Penalty forces Browns into 1st-and-16. 3rd-and-13 SACK! Andre Branch! Forces Cleveland punt. Dolphins moving the ball as the third quarter comes to the end. Picked up 51 yards on 4 plays after the punt. Anthony Steen injured on the first play of the third quarter. Kraig Urbik taking practice snaps with Tannehill. Not good. TOUCHDOWN! Tannehill to Damien WIlliams for 10-yards. Miami 24-13. Random observation. Billy Turner was in at tight end on that touchdown play. Interesting move. The Browns start moving the ball and Miami does not seem to have an answer. Maybe someone should try covering Terrelle Pryor. Strip sack! Cameron Wake! Jelani Jenkins recovers and returns it 37 yards. BULL! Cameron Wake called for offsides. Play doesn’t count. Kessler taken out of the game for blood on his elbow. Pryor going in at QB. Touchdown Browns. Pryor 3-yard run. 24-21 Dolphins lead. Browns have momentum against a defense that is struggling to stop them, so the Dolphins offense goes three-and-out. Punt. Dolphins actually force a Browns three-and-out. Punt. Dolphins pick up a first down, but have a five play, -1 yard drive and have to punt. Ouch. Pryor is just destroying Miami. He has seven receptions for 135 yards, four carries for 21 yards and a touchdown, and 2-for-4 for 32 yards so far today. And he’s not done. Field goal. Browns connect from 38-yards. Tie game 24-24. The Browns started that drive from their own 6-yard line. Defense could not do anything to keep them from tying the game. But everyone wants to blame Tannehill. Dolphins go three-and-out. Offense has to do better. Defense forces a punt and the offense has a chance to end this. Nope. Tannehill stripped and the Browns get the ball back at the Miami 27. All it takes is a field goal now. 4 seconds left. AND HE MISSES! Third missed field goal of the game for the Browns. Cleveland wins the toss....and elects to kick? Guess it was a good choice. Dolphins immediately put after one first down pick up. Now Cleveland just needs a FG to win. Good punt from Matt Darr to at least pin Cleveland inside their 10. Defense steps up. Sacks and penalties force Cleveland into a 3rd-and-28. Can they get off the field? Running play from Duke Johnson and it is a Cleveland punt. Dolphins have to put points up on the board now. 44-yard punt, 13-yard return from Landry. Starting in Cleveland territory. Just need to kick a field goal for the win. There you go Dolphins! Long pass to Landry from Tannehill for 32-yards! TOUCHDOWN! Ajayi for 11-yards and the game winner! I honestly have no idea how to feel about this game. The Dolphins won! That’s great! The defense looked bad and gave up an 11-point fourth-quarter lead to allow Cleveland to force overtime. That’s bad. The offense, especially Ryan Tannehill, was inconsistent. That’s not really that good either. The team now has four days to get ready for the Cincinnati Bengals, and I am not sure if the quick turn around will be good to shake off the bad from this game, or will only make things worse. This is just a confusing game that will take some time to process.